The California Chamber of Commerce is urging the U.S. Supreme Court to review a decision that threatens to disrupt existing arbitration agreements and erode the benefits of bilateral arbitration as an alternative to litigation. 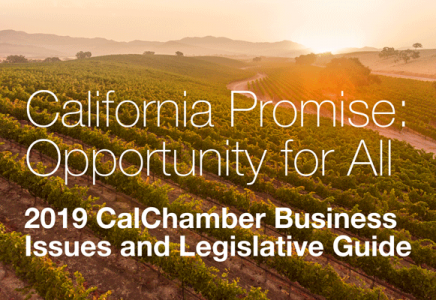 The CalChamber has joined the U.S. Chamber of Commerce in a friend-of-the-court brief seeking the U.S. high court’s review of the 9th Circuit U.S. Court of Appeals ruling in Nancy Vitolo v. Bloomingdale’s, Inc. The Bloomingdale’s case is just the latest chapter in a long and well-documented history of attempts by courts in California to “invent new ‘devices and formulas’ aimed at circumventing binding arbitration agreements and the preemptive force” of the Federal Arbitration Act (FAA), the CalChamber/U.S. Chamber brief states. The 9th Circuit decision in Bloomingdale’s relies on a split 2015 decision (Sakkab v. Luxottica Retail North America, Inc.) that endorsed a 2014 California “judge-made rule” that bilateral arbitration agreements under the state’s Private Attorneys General Act (PAGA) may be prohibited, despite the FAA (Iskanian v. CLS Transportation Los Angeles, LLC). The U.S. Supreme Court review of the case is urgently needed to bring California’s state and federal courts in line with the FAA’s controlling principles and to promote the uniform application of arbitration rights nationwide for the benefit of businesses and individuals. Nancy Vitolo agreed to arbitrate any dispute with her employer on an individual basis, and expressly waived her right to participate in any class or representative actions arising out of her employment. In filing suit, she seeks to avoid that binding agreement and assert the functional equivalent of class claims on behalf of thousands of other employees by invoking California’s Iskanian rule, which prohibits the waiver of representative PAGA claims as a matter of state law. The CalChamber/U.S. Chamber point out that the U.S. Supreme Court rejected an approach similar to the one advocated by Vitolo. In AT&T Mobility LLC v. Concepcion, the U.S. Supreme Court said state law rules that invalidate parties’ agreements to arbitrate on an individual basis interfere with the fundamental attributes of arbitration and therefore are preempted under the FAA. Barred by the Concepcion decision from using the anti-waiver rule to bring a class action lawsuit, Vitolo seeks the functionally identical result by invoking the Iskanian anti-waiver rule to bring a representative claim under PAGA. Vitolo’s strategy is part of an increasing trend among California plaintiffs to try to avoid bilateral arbitration agreements and the FAA’s requirement that the agreements be enforced according to their terms. The CalChamber/U.S. Chamber argue that representative PAGA actions are the equivalent of class actions, so the Iskanian rule is preempted by the FAA for the same reasons the U.S. Supreme Court cited in deciding that the so-called “Discover Bank” rule (in the case of Discover Bank v. Superior Court) was preempted. The U.S. Supreme Court said the FAA requires that courts enforce bilateral arbitration agreements despite contrary state law, unless that state law is both a “generally applicable” defense that permits the revocation of “any contract,” and does not otherwise “stand as an obstacle” to the goals of the FAA by interfering with a fundamental attribute of arbitration. The CalChamber and U.S. Chamber side with Bloomingdale’s in agreeing that the Iskanian rule fails this two-part test. Studies have shown that arbitration is faster than litigation. Consumer arbitrations administered by the American Arbitration Association typically are resolved in four to six months. A study by the California Dispute Resolution Institute found that consumer and employment disputes were resolved in arbitration in an average of 116 days. In contrast, as of September 2016, the median time for a civil lawsuit filed in federal court to reach trial was 27 months, and more than 53,000 civil cases were left pending for more than three years. State courts, especially in California, have caseloads that are even worse, a problem that has been compounded in recent years by state budget cuts. Moreover, arbitration is far less expensive and more accessible for low-income plaintiffs than traditional litigation. Under many employment arbitration agreements, arbitration often costs employees nothing, as the filing and attorneys’ fees are shifted to the employer. The informality and greater efficiency of arbitration also makes it less expensive for businesses. Employees tend to fare better in arbitration. Studies have shown that plaintiffs who arbitrate their claims are more likely to prevail than those who go to court.